Home Uncategorized Welcome, Blue Ethel!!! BOOK GIVEAWAY!!!!! Blue Ethel took almost ten years to become a book. Someone asked me if that’s because I put it away for a while to work on other things? No, not really. Ethel was just a little pokey in her journey to find the right ‘owner’. She finally found her person when Margaret Ferguson, of Margaret Ferguson Books, Farrar Straus and Giroux, adopted her. Blue Ethel had a book birthday a few weeks ago. Today I thought that I would share a little about writing and illustrating her story. Also, leave a comment for the chance to WIN A BOOK! Suzanne will announce the winner on her post next Tuesday. This is a real picture of my sister-in-law’s cat, Ethel. We were visiting the New York Reinhardts when all of a sudden Ethel trotted in from outside. The square little cat stood in the center of the living room poised for admiration. Her belly hung low and her skinny tail stood straight up like an antenna. It took several minutes to come to the realization that she had rolled in my niece’s and daughter’s sidewalk chalk masterpieces. I wondered how Ethel felt when she heard our giggles? And from that moment on I knew that I wanted to write and illustrate her story. 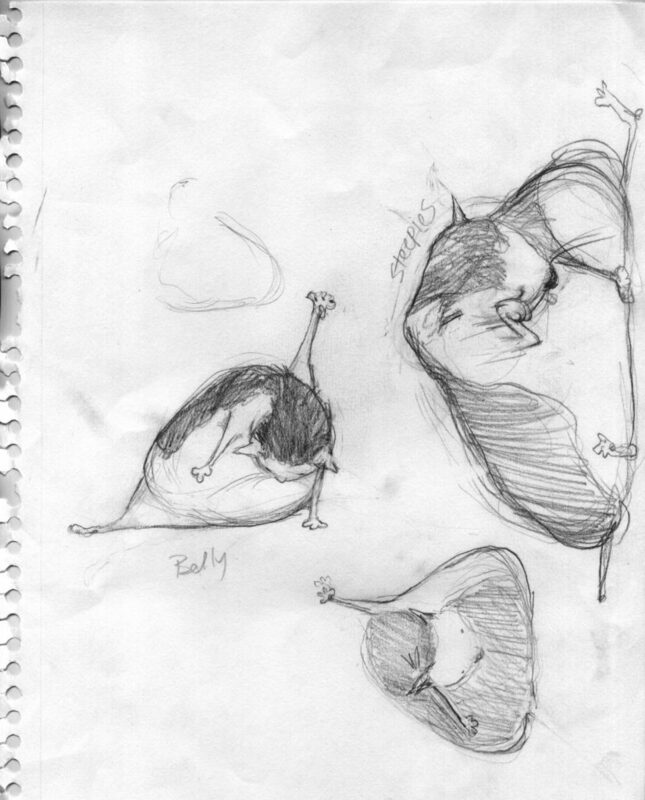 I imagined a cat who was an exaggeration of what I think about cats (I had Maxfield, a girl calico, named after the illustrator (Maxfield Parrish), for over 20 years). I believe cats to be rather ‘self-focused’ shall we say? And so I began to picture a cat who took her “work” very seriously. Ethel’s menial tasks were her life’s occupation. So, what would happen if this meticulous cat rolled in sidewalk chalk, as the real Ethel did, and found herself blue?! When Ethel turns blue, she feels blue. She’s too distraught to go on with her day and finish her outside work. 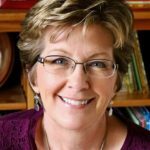 I hope that readers will discover, as Ethel does, that seeing yourself as beautiful ‘no matter what’ can allow us the opportunity to grow in our own uniqueness, creativity, and self-expression. Blue Ethel is a story about being yourself, and friendship, but it’s also about taking some risks and trying new things. At Ethel’s launch party yesterday an older gentleman with rainbow suspenders raised his hand during Q&A. He said that he believes that Blue Ethel should be required reading for senior citizens. That he was old, he was fat, and he was probably rather set in his ways. He said it would do him and many others he knew, some good to open their eyes and try new things! I welled up a bit at that beautiful sentiment. So, Blue Ethel is now out in the world. I would love it if she could bring some smiles, and share some color, with all ages. Don’t forget to leave a comment for the chance to win a book! 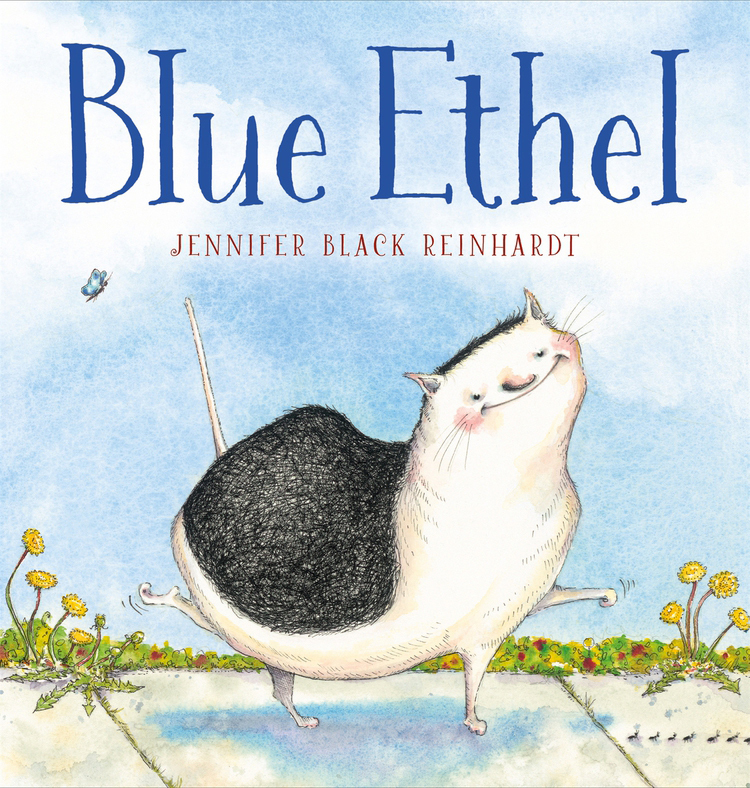 Blue Ethel, Jennifer Black Reinhardt, picture book. Bookmark. This looks like a delightful story! I will surely be on the lookout for it. Thanks for sharing. I’m excited and happy to share! Thank you so much, Jennifer, for stopping by today! I love Ethel already! Can’t wait to get my hands on a copy. Congratulations on finding the right owner, Jennifer! Luck and persistence, Jody! Thank you so much!!!! Blue Ethel looks terrific! I’ll be sure to seek her out. Thank you, Anne, and thanks for taking the time to visit and comment! So cute! I can’t wait to read! Thanks Lynne! Good luck in the drawing! Ethel, I can’t wait to get to know you better! Hi Barb, thank you for visiting Picture Book Builders today! I hope you like the book! Ethel is absolutely charming, but Fluffy looks like an adorable scene stealer! Congrats Jennifer, for persisting on Ethel’s behalf. Nice to see you, Cathy. You’re exactly right… Persistence! Thanks so much! Irresistible. And mine is on its way! Yippeeee!! Thanks for sharing Ethel’s story. Those illustrations are wonderful! Thanks so much, Amanda! It was a very different process being both writer and illustrator. I think I’ll do a post about that sometime. Thanks for visiting! 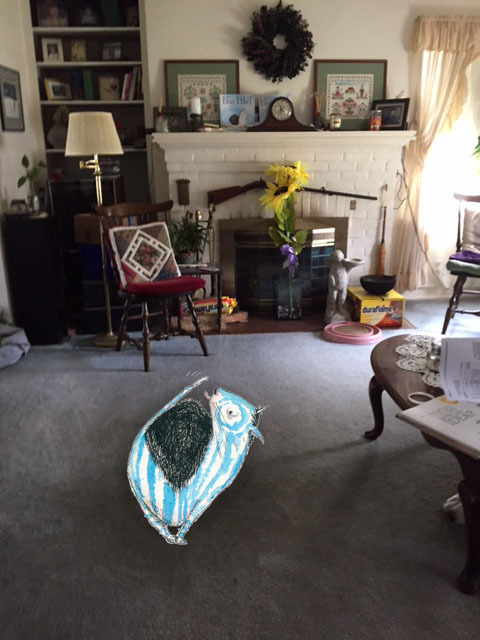 I love that Blue Ethel is connecting with readers of all ages. Congratulations, Jennifer! Thank you, Traci! Yes, that was a very special moment and one of those comments that make you appreciate the importance of picture books. There’s nothing else like them! Thanks for stopping by this morning! Jennifer! It’s such a great book! Congratulations! Thank you so much, Pat!!!! I share my space with three cats. My Rocco is built like Ethel, he looks like a 13×9 pan with a head and a tail. I have added Blue Ethel to my must buy and read list, and will be making sure my grandchildren have a copy. 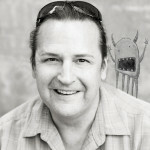 I quite enjoyed reading about and seeing your process to bring Ethel to a “wider” audience! Thanks and congratulations! This looks fantastic, Jennifer. Such a great message–and Ethel is adorable! Congratulations!! I have a feeling I’m going to be Ethel’s biggest fan! She would love it, Mel! Thanks so much!!!! Ethel is a pill. Love this story already and look forward to getting my hands on the book. And appreciate hearing your journey to bring the book to life. I have a couple of pokey manuscripts just waiting for the right person as well, so you give me energy to keep at it. Thanks! It just takes one person and a lot of persistence. Hang in there, Jennifer! It’s very, very rarely fast and easy and is most often a very hilly, bumpy, and winding path! Thank you! Oh wow! This book looks ADORABLE! Can’t wait to read it. Congrats! Hi Katy, thank you so much! I hope you like Blue Ethel! Ethel sounds like a love magnet. I’m very attracted ;-)!! Hooray for Ethel and you! Hahaha! I’m sure she thinks she is! Thank you so much, Andria! Ethel sounds very much her own “person” – er, cat. She is lovely in black and white, in blue, and in rainbow stripes. She reminds me of our cat Winston, a furry orange guy who lived 18 years and was known to everyone in our neighborhood as the one who would trot over with an occasional (dead) mouse gripped in his teeth as a calling card. Your illustrations are gorgeous! Can’t wait to read the book. Thank you so much, Carole. And for sharing your story about Winston’s (great cat name) generosity. I don’t think Ethel was a big huntress, but I know my sister in law had another cat who would lovingly bring presents and set them on her pillow as she slept… cats are funny no matter what. Thanks!!!! I’m glad Ethel was patient. Looks like a wonderful story. Ha! Yes, David, sometimes it’s hard to find the right road. I believe she got there eventually. Thank you so much for visiting! I love Blue Ethel! The story and art both look wonderful. Hope I win, but if I don’t I will run out and buy a copy for my collection. Thank you so much, Abigail! And thanks for commenting, good luck! You can’t go wrong with a saucy cat! Congratulations, Jennifer! This is true, Janet! Thanks for stopping by and commenting!!! I can’t wait to read Blue Ethel! What adorable concept and the above illustrations are fantastic. And the gentleman who said should be “required reading”–how precious. Congratulations on your success!! Thanks for your kind words, Elizabeth! Have a great day and thank you for stopping by and commenting! I’m adding this to my list! Thanks so much, Tracy! Have a wonderful day! Sounds like a fantastic book! Can’t wait to read it! Hope you like it Debra! Thank you for taking the time to visit and comment!!!! Adorable! I love Ethel! She personifies CAT perfectly. Makes me laugh. I have 2 ‘Ethels’ though one is stick thin and the other has a swinging belly. Congratulations! Hi, Angie! They sure do come in a lot of interesting shapes and sizes. Just like we do! Thanks for stopping by! I love Ethel and her message. Thanks for sharing this, Jennifer! Thank you, Katrina, for visiting and commenting! Have a wonderful day! Oh man! This looks incredible, Jennifer! Can’t wait to get my hands on this one. And, as always, love, love your illustrations! Illustration love right back at chya, Kevan! Thank you, I hope you like Ethel when you ‘meet’ her. Thanks for your comment and compliment! Blue Ethel is delightful! I love her personality, her looks and the book’s message! If it takes 10 years to create a masterpiece…so be it! Thanks for sharing. What an absolutely lovely thing to say, Danielle. Ethel and I thank you!!!!!! Congratulations on your new book. I can’t wait to read and share it. I love the elderly gentleman’s comment. It shows that picture books are for everyone. Thank you so much, Claire! That’s exactly it— reaffirming for all of us! Thank you for visiting, hope you have a wonderful day! Jennifer – I saw your feature in Book Page magazine. So fun! It was A LOT of fun to do, thank you, Sandy!!!! Have a wonderful day! This is wonderful…can’t wait to get my hands on a copy! Thanks for sharing…and congrats! Thanks so much, Katie! I hope you like the book. Have a terrific day (and if your weather is like it is here, stay cool!)! This looks wonderful – I already love Ethel!! Your illustrations are so charming! Thank you so much, Lynn! I hope you enjoy the book. It was nice of you to stop by PBB today!!! I love the story and the illustrations! Anyone who has ever own a cat can appreciate Ethel’s set-in-her-ways personality. They know what they want and when they want it. The same with people. They know who they like and if they don’t like someone how to show it (leaping off the fridge onto unsuspecting shoulders or peeing on that person’s unguarded jacket:( ). Hi Jane, while I believe that Ethel would be too set in her ways for that behavior, I’m sure she would, indeed, form very strong opinions. Thank you so much for your compliments and good luck in the book giveaway! Loved hearing the story behind the story, Jennifer. I love your illustrations so much, and cannot wait to read this one!! Congrats!! Thank you for being so kind, Maria! I do hope you like the book. Lovely to see you here, have a wonderful day!!!! Perfect, Bridget! Thank you so much!!!!! Have a wonderful day! Adorable! 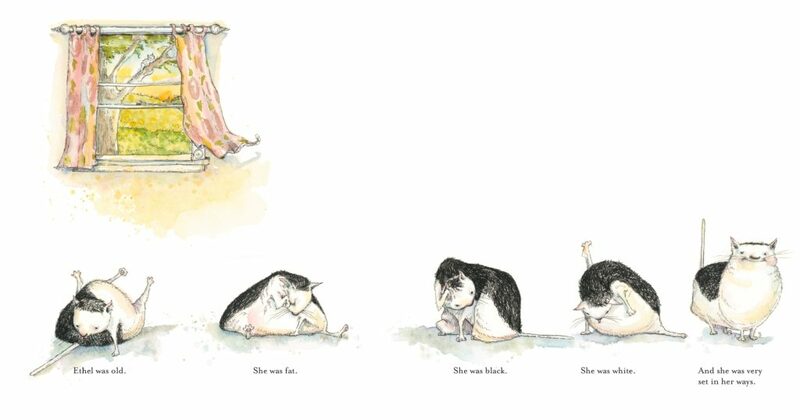 I can’t wait to read the story of Blue Ethel…and share it with my grandchildren who are kitty crazy. Hi, Deborah, thank you so much for visiting and commenting! Hope you like the book! I love the story and the illustrations are amazing! 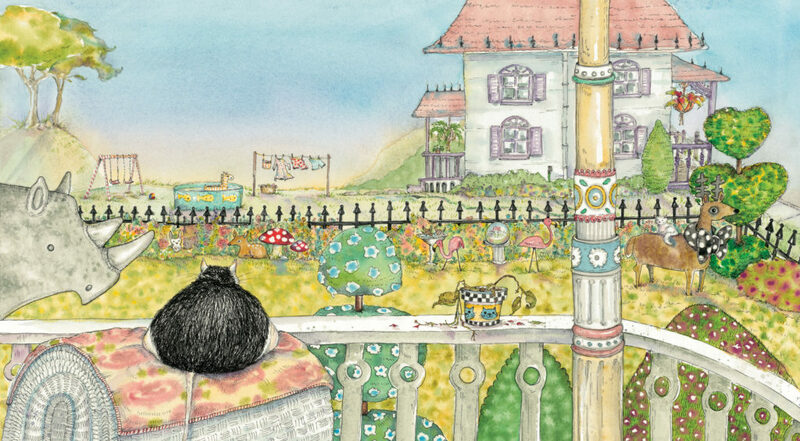 I especially love the illustration of Ethel sitting on the Victorian porch. The fact that this is based on a real event makes me love the story even more! Thank you so much, Stacy! It’s fun to reinvent Ethel’s surroundings and create a new world for her. Good luck in the drawing and thank you for your compliments!!!! This sounds like a great story, and I love the illustrations! Thank you, Rachel! I am grateful for your kind words— Have a wonderful day!!! Looks like an adorable story with a valuable lesson! Congratulations and I look forward to reading it! Thanks so much, Pamela. I hope you enjoy it!!! I’m not typically a cat fan, but I believe you’ve just made me into one. I Love Ethel! Congratulations Jennifer! Ha! It’s wonderful to know that Ethel has some universal appeal. Thank you very much for visiting and leaving a kind comment! I love the idea of this story and what you want the readers to take away. The illustrations are so adorable! Thank you for sharing how you got the idea and developed it. Thank you, Danielle, for stopping by today and leaving kind words. Good luck in the give away! This book sounds adorable. Jennifer captured the cat personality beautifully. I will be on look out for this one. Thank you, MD, I hope you like the book when you find it!!!! I need to get over to Prairie Lights and buy this book!! I love the sentiment and I love your artistry, Jennifer! Hi Susie! You’re so kind, thank you! And wonderful to see you Sunday— albeit unfortunately briefly! Jennifer, can’t wait to see the book. So happy for you. Such talent and creativity! So whimsical! Love all of Ethel’s poses. Thank you Ruth! She’s pretty bendy for a plump gal! Have a great day! Oh my goodness! I can’t wait to get a copy of this book! The illustrations and text you shared are delightful, and the story you shared about the older gentleman at your book launch was heartwarming. Thank you for introducing us to Ethel! Thank you, Becky, I hope you enjoy Blue Ethel. The gentleman’s comments truly hushed the room and I know many of us there teared up a bit. To be honest, I was holding my breath at first and then just couldn’t believe how eloquent and meaningful his comment was. Certainly one of those moments that I will never forget. Thank you for visiting and have a terrific day! Ethel is a delightful character. How many of us know not only an animal friend but a people friend who lives within the boundary of self imposed routine? Ethel’s world and her sense of rightness is turned up-side down. Her journey to broaden her view of acceptable and be alright with it will captivate young readers. I know I was. Charming illustrations. Thank you, Sandra, for your absolutely lovely comment! I’m so glad that you enjoyed Blue Ethel. Thank you for taking the time to comment and be eligible for the book giveaway! I hope you have a wonderful day. Thank you, Jennifer, for bringing Ethel into the world where readers of all ages can relate to this unique and lovable character. I can’t wait to get this charmer! Thank you for taking the time to leave such a lovely comment, Anne! Have a beautiful day! I love what sparked your idea, Jennifer! The world is full of stories if we tune in! Blue Ethel sounds like a wonderful book! Thank you, Mary, I hope you like Blue Ethel! You’re entered in the give away! I love forward to reading it! Love the illustrations! Hi Katie! I hope you enjoy Blue Ethel when you do— thank you! I am (sorta) old (and hopefully not too) fat and I think this book is the cat’s meow. Ha ha! Thank you so much, Quinette! Have a fantastic day! Congratulations and thank you for getting Blue Ethel out into the world. I can’t wait to read it. The world needs this book. What a heartwarming thing for you to say, Kathleen! Thank you so much!!!! Can’t wait to get my paws on a copy! It looks purrrrfect! Ha! Very good, Kris! Hope you like Blue Ethel! Thanks so much for visiting and commenting! I just saw this book for the first time two days ago and knew instantly I need to get my hands on it. The illustrations are absolutely delightful and I can’t wait to read the story in its entirety to my kids. Hi Mirka, what a nice thing to say! Good luck in the giveaway, and thank you! This post was just lovely. I love hearing the story behind the story. Thank you for sharing. Thank you, Angela for visiting PBB and taking the time to comment! Have a happy day! Lily is my granddaughter, who, along with her mom, lives with me since her parents’ divorce. She is 6 years old and just finished a fantastic year of kindergarten. She is learning to read and loves cats and dogs. She would adore this book. (She also has Down syndrome, so it would boost her self-esteem to read a book about embracing one’s own uniqueness!) I will definitely be seeking this book out to read to my precious Lily. 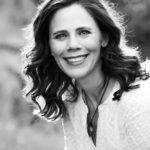 She is having a very hard time with the divorce and could really use some ‘positive input’ in her life right now!! Thank you so much for creating this book. I can hardly wait to read it! Thank you so much, Sharon, for sharing your story. It’s obvious that Lily has a very caring and loving Grandmother. 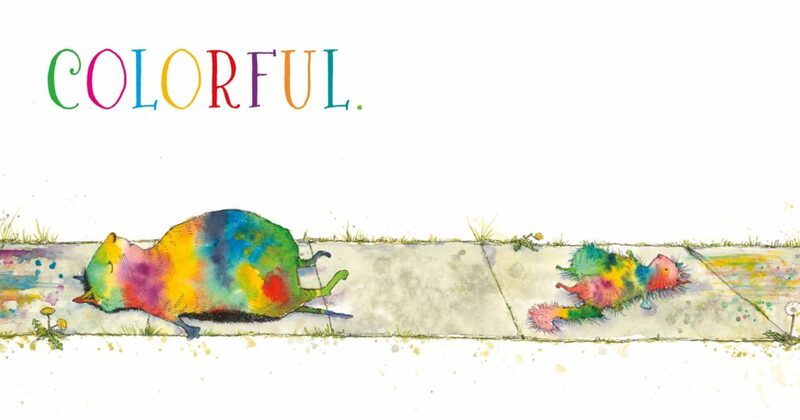 I love the idea of using picture books to help children, or anyone, through a difficult time. Thank you so much for visiting and commenting. Congratulations Jennifer! Can’t wait to curl up with my kitty and read this book. That’s a neat picture that you painted, Erin! Thank you so much! This story just feels like a real heart warmer. Especially for someone, like me, who doesn’t like change. Thank you, Cindy, I hope you enjoy the book. Who knows what color you might color your hair after you read it!? This sounds darling. Can’t wait to read it! Thanks, Tina, hope you enjoy it! Thanks for visiting! Our motto is, “Be Colorful”! Thanks for stopping by and commenting, Kathy! Thank you very much, April! I agree, cats are indeed strong characters. Thank you so much for your kind comments and for visiting PBB today! 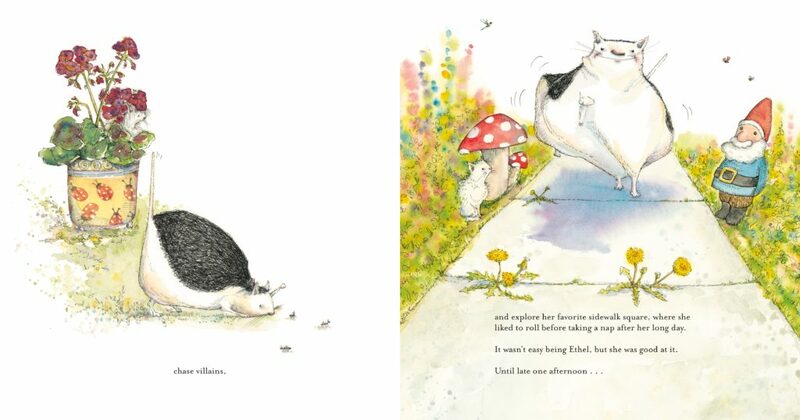 I *adore* these illustrations, and the story looks wonderful. Big congratulations to Blue Ethel on her recent book birthday!! Thank you so very much, Carin! Blue Ethel is adorable, and she reminds me of my very spoiled Daisy. Like Ethel, she is old, fat, and set in her ways. Too bad it took ten years for her to find a home, but I’m glad she has finally arrived! Daisy… perfect name! The ten years is probably not horribly uncommon when I really think about it. Being both the writer and the illustrator, I’ll bet if you added up total time for many picture books with separate authors and illustrators it would come in close to the same time frame? Thank you so much, Linda! I love this character already. Who says picture book characters have to be kids? They certainly can be grumpy old set-in-their-ways adults…as long as those adults are cats (or some equivalent). As always, your artwork is charming charming charming! And so is the story. Thank you so much, Heather, for your lovely compliments! Good luck in the giveaway! This looks amazing! I am adding it to my TBP list (to be purchased) but would love to win it!!! Thanks for the chance! I hope you like Blue Ethel when you meet her! Thank you so much, Michelle! I’m loving it already. I can’t wait to read it. One of our cats nuzzles the flowers and comes in with a yellow face from the pollen. So glad Blue Ethel finally found a home. I want a poster of that last image. Colorful! Hi Mary, thank you! That’s funny about your cat turning yellow! One thing I’m learning is how much fun reading Blue Ethel out loud with kids is. You can imagine how they love shouting that out, “COLORFUL”! Thanks for visiting PBB! This is so charming Jennifer! Congratulations on Blue Ethel. Can’t wait to get my copy! I haven’t read it yet, but I want to read it to my senior mom. I can’t wait to read it. Thanks for sharing. Oh Susan, I got chills when I read your comment. The thought that Blue Ethel can reach both young and old makes me so happy. Thank you so much! Hope you like it, Lauri! Thank you so much!!!! 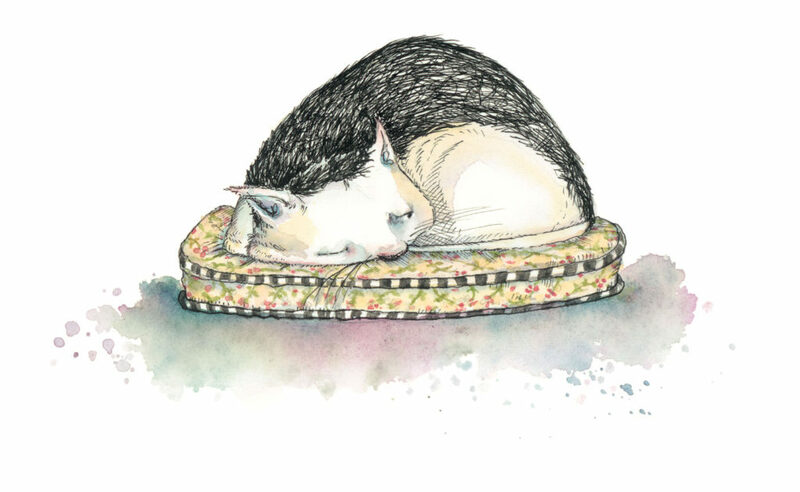 A blue chalked Ethel could be a real cat-astrophe (especially if one had white carpets) but you reacted to the situation purrfectly…you wrote a story about it. 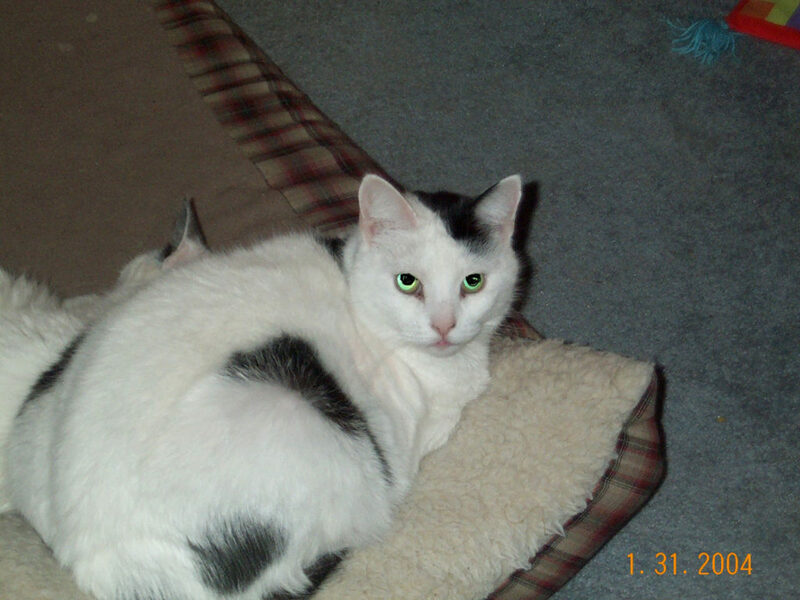 OK, so it took 10 years to find the story a home, but you remained paws-ative and found the right home for it. YAY! You must be feline good. It looks incredible. I can’t wait to read it. What a great story! I cannot wait to read the book. My boys are going to love it, too. 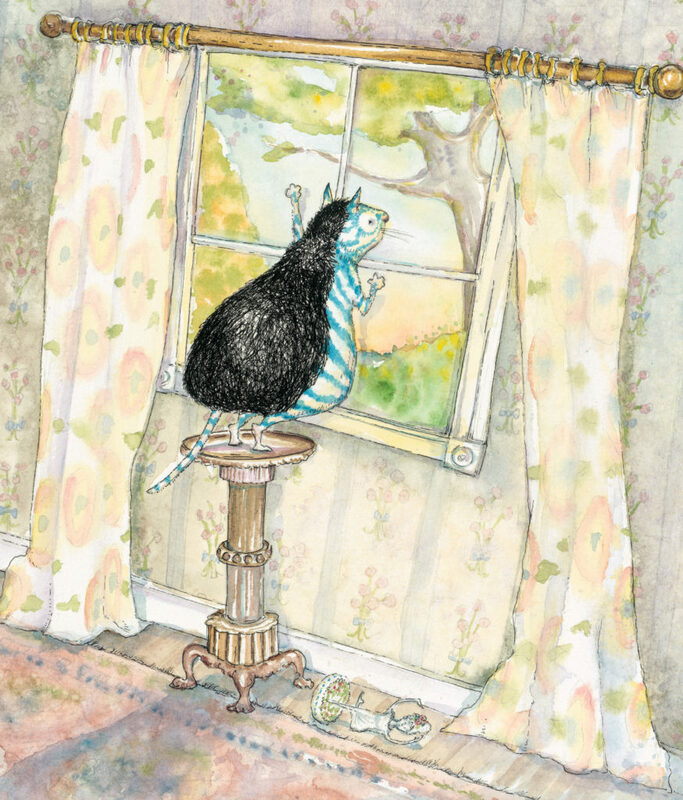 I always knew there were life lessons to be learned through a story about a cat:) Thank you for writing Blue Ethel!!! Ah yes, there sure are! Thanks, Sheri! This sounds adorable! I can’t wait to read about Ethel! Hi Heather, thanks for visiting PBB and entering the book giveaway! Love seeing the evolution of Ethel! Thanks for sharing. Can’t wait to read about Ethel! Hi, Julie, thank you very much! Hope you enjoy Blue Ethel when you read it! Wonderful book and fantastic blog post, Jen. I love the comment from the older gentleman about Ethel being a role model for us all. So true!! What a wonderful, and fun story. I love the detail that you put into creating this book. Thank you so much for all your hard work. Gosh, Jen, thank YOU! Good luck in the giveaway and thank you for visiting PBB! As a teacher, I highly recommend this book! Students loved this book because the illustrations were funny and they could easily connect to the story. After a read aloud, students were inspired by Ethel. They continued to discuss the story as they drew pictures of Ethel and Fluffy on the sidewalk. Blue Ethel is sure to become a class favorite in many classrooms across the country! Terri, you have been such a supporter and champion for Blue Ethel I just cannot thank you enough! Thank you for your very kind comment/compliment/endorsement—- you are wonderful!!!!!!! Blue Ethel had been on my “anticipation list” so I got my hands on my library’s copy as soon as it was processed. And not to gush, but I loved it. You can teach an old cat new tricks! Great job, Jennifer. Oh LeeAnn, please feel free to gush! I love gushing!!!! Seriously, thank you so much for this kind note. It means the world to me that you enjoyed Blue Ethel!!!! Thank you!!!!! A fastidious cat who is suddenly “blue.” Can’t wait to read this one! The illustrations look really fun, too. Congratulations! Thanks, Judy! Hope you enjoy Blue Ethel! Thanks for stopping by PBB and entering the giveaway! The illustrations are adorable! The story looks so cute and fun. Huge Congrats, Jennifer! I just saw Blue Ethel at my local bookstore, and was so excited about it! Way to go! !